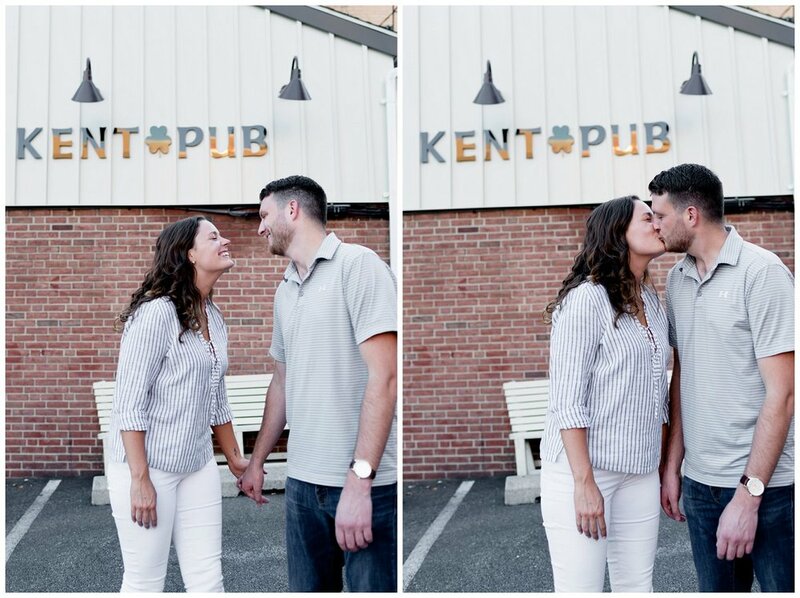 They met the Kent House Irish Pub in Towson, Maryland where Jordan's worked for over 6 years now. When they met and were getting to know each other, they discovered the fact that they had a love for rugby in common, and that Jordan's dad coached Brian. They may have even played rugby together as kids and din't even know it, and are still currently on the hunt for potentially proving photographs. :) Rugby is still a big part of their lives now. Fitz plays for the Baltimore Chesapeake RFC, and Jordan does the social media for his team. He's won Player's Choice and Most Valuable Back for two years in a row! They've been dating for over 5 years as of 4/21 and plan to get married on 4/20 next year which is special to be married just about to the date that you officially became a couple. Together they have an adorable black lab Ruca who came along for the shoot of course. They love to bar hop around Baltimore, go to the beach, and eat seafood... but their favorite thing to do is laugh. Ruca loved sniffing all of the smells and watching the geese so much that she jumped out of the back truck window (that they thought was closed, thank God she was safe because they'd parked across the road from where we were, but I'm sure she looked both ways before crossing......). We looked up and saw this black blur bolting back down to the water! Knowing she was safe, it was hilarious, but Fitz had to catch her and take her back up to the truck. She was so disappointed and just wanted to explore... lol! The scene was literally out of the notebook movie or something... It was beautiful. I am so happy to photograph for these two and can't wait for April to come!! Their day is going to be so much fun and I can hardly stand to wait for it!